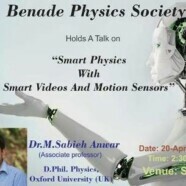 On 20 April, Benade Physics Society held a talk on Smart Physics with Smart Videos and Motion Sensors. The talk was presented by Dr Sabeih Anwar from LUMS. He has many achievements throughout his academic life. He has been a top scorer in Lahore Board at intermediate level. He got his BS degree from UET and was given scholarship to complete his DPhil from Oxford University. This talk was attended by students from different majors. 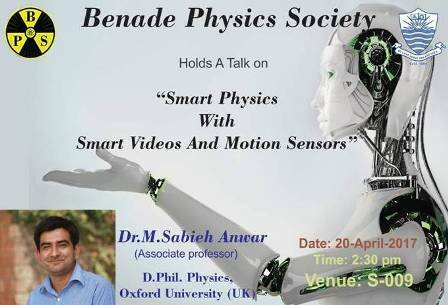 The talk was thought provoking as he talked about the new software they have just introduced in LUMS, known as “Physlab”. The talk concluded with a shield being presented to the honorable guest.